The heartrending documentary “Waiting for Fahd,” tells the story of CCR client Fahd Ghazy, a Yemeni national unlawfully detained at Guantánamo since he was 17 and who is now 30. Through moving interviews with his beloved family in Yemen, “Waiting for Fahd” paints a vivid portrait of the life that awaits a man who, despite being twice cleared for release, continues to languish at Guantánamo, denied his home, his livelihood, and his loved ones because of his nationality. Read Fahd's appeal to viewers of the film. Share this page and video through e-mail, Twitter, and Facebook with #FreeFahd. Stand in solidarity with Fahd. 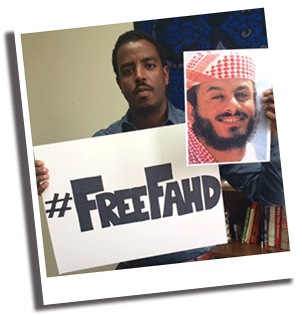 Take a photograph of yourself holding a #FreeFahd sign and upload it to our Tumblr page. Plan a screening of the film in your town, at your school, your church/mosque/synagogue, your home – wherever you are. Contact CCR for our screening toolkit. Please note whether you would like the Arabic version of the film and advocacy materials. Educate yourself about the human rights disgrace that is Guantánamo. Go here for more client profiles and more information about CCR's work to end indefinite detention and close Guantánamo. One enduring and pernicious myth about the men detained at Guantánamo is that they were all sent to the prison after being captured on the battlefield by U.S. forces in order to neutralize the threat they posed. Nothing could be further from the truth. The vast majority of Guantánamo detainees were ensnared in a slipshod bounty-system in which the U.S. military paid handsome cash rewards to locals for turning over anyone who seemed out-of-place. In other instances, they were simply handed over to the U.S. military by local police forces. Many vulnerable young men and boys were ensnared in the process and Fahd, just 17 years old at the time, was one of those unfortunate souls. After 13 years at Guantánamo, the U.S. government failed to find a basis to bring a single charge against Fahd; it abandoned the core allegations against him for utter lack of substantiation; and two successive presidential administrations concluded that Fahd should not be at Guantánamo and cleared him for release. His citizenship, and not his conduct, is the reason Fahd remains trapped at Guantánamo. Currently, more than half of all prisoners are from Yemen. And more than one-third of the prison population is Yemeni men who, like Fahd, have already been cleared for release. This shameful scenario is the result of the Obama administration’s calculation that, after the failed underwear-bomber attack, the backlash that would follow the transfer of a Yemeni prisoner would be too politically damaging. That is why President Obama instituted a self-imposed moratorium on all transfers to Yemen in early 2010 that he did not lift until the height of the mass hunger strike in 2013. And even after the moratorium was officially lifted, it was not until November 2014 that a Yemeni prisoner was finally released. Fahd continues to wait, day after day, for the government to act on its own determination in his favor. That is all that now stands between Fahd and freedom. “Waiting for Fahd” depicts a rarely seen story about Guantánamo, one that reveals the human toll indefinite detention takes on both the prisoners and their families. Sharing Fahd’s touching story widely can help speed up his release. Decision-makers in the U.S. government who control Fahd’s fate need to know that it is not just Fahd who is waiting anymore, but the public at large is too – waiting for this Administration to do what is right. Sharing “Waiting for Fahd” with friends, family, colleagues – anyone you think might care more about what has happened at Guantánamo and what continues to happen there – is not just raising awareness, it is raising your voice. And a pitched public outcry to end Fahd’s senseless continued detention is exactly what we need now to finally bring his torment to an end.